This is one of the easiest paella recipes EVER. I made this on New Year's Eve and it was a huge hit. It's super festive, delicious and the best part is...leftovers! I hope you enjoy it as much as my family did! 1/4 teaspoon ground saffron- wondering about how to prep saffron? Check out my video here! 1. First add a few shakes of paprika, some salt and pepper to the shrimp, combine ingredients and place in the fridge for 15 minutes to a half hour. 2. Sauté chicken sausage in 1 tablespoon olive oil and set aside. 3. Using same pan, add half a 1/2-1 tablespoon of olive oil and sauté onion and garlic for 1-2 minutes until they start to brown. Add grated tomato and pulp, combining with onion and garlic for few minutes, scraping up all those tasty golden bits. Add rice, paprika, saffron, salt, pepper and cooked chicken sausage to the pan and combine ingredients together for 1-2 minutes so that the spices are well distributed. Add broth and give all the ingredients a good stir, bring to a boil, then simmer until broth is absorbed and rice is cooked (approximately half an hour). 4. Meanwhile, sauté shrimp in 1/2-1 tablespoons olive oil cooking for a few minutes on each side. 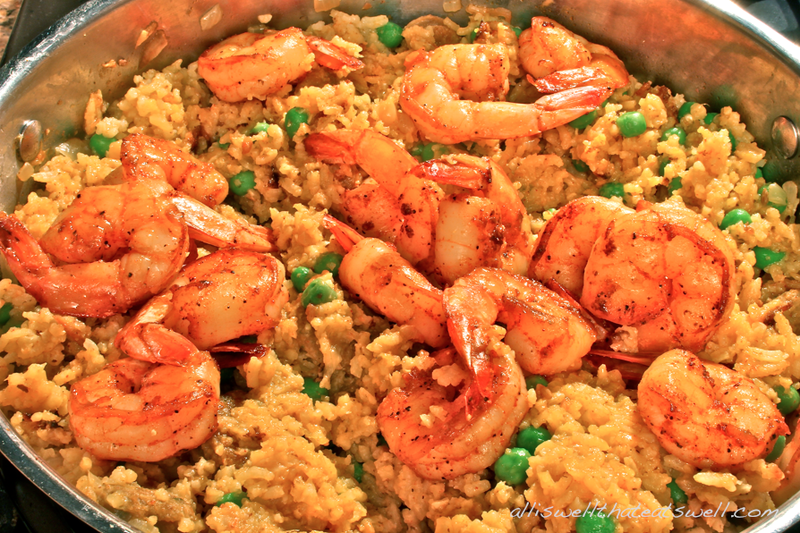 Once rice is fully cooked, add peas and cooked shrimp to paella and serve immediately!